5¾ (6¾ , 8)" hand circumference and 7½ (7½ , 8¾ )" long. 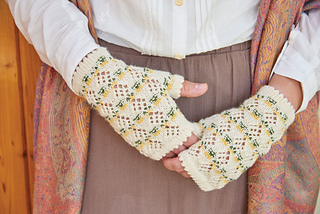 Mitts shown measure 6¾ "
Today’s rose gardens have little in common with those during the Regency era. Then, rose bushes were indeed more of a bush, with some of them up to six feet tall and shrubby in nature. Their flowering season, as for all old-time roses, was a short summer flowering with the entire bush covered in hundreds of blooms.These delicate fingerless mitts enable you to carry your rose garden with you at all times. The mitts are knitted in the round from the bottom up. The cuff has a folded picot edging, the main part is a lace and colorwork pattern, and they cover about half of the fingers with another folded picot edging.